The attorney general announced five months' worth of anti-Trump texts between two former Mueller team members weren't retained. 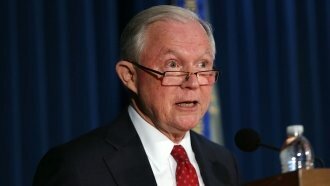 Attorney General Jeff Sessions has ordered an investigation into anti-Trump text messages sent by two FBI agents last summer. Agent Peter Strzok was pulled from the department's Russia investigation after the discovery of said texts, which expressed bias against President Donald Trump. Trump tweeted Tuesday morning: "In one of the biggest stories in a long time, the FBI now says it is missing five months worth of lovers Strzok-Page texts, perhaps 50,000, and all in prime time. Wow!" He's almost correct. Trump's referring to an announcement by Sessions on Monday that the FBI didn't keep any of the messages sent between Dec. 14, 2016, and May 17, 2017. But the 50,000 number is the total number of texts the FBI collected, not the number it lost during that five-month period. Language in the texts included calling then-candidate Trump an "idiot" and saying he "simply can not be president." Despite Strzok's reassignment, Republicans have claimed the texts show bias against Trump in the Russia investigation.